I seem to skip a year whenever it comes to celebrating Halloween. But this year, I'm going all out! Tonight is Part 2 of my Halloween celebration. Yesterday evening was Part 1, and this is what I served: cutesy oreo owl cupcakes with poison cocktails. Tonight I'm celebrating Part 2, and I'm taking things even further. 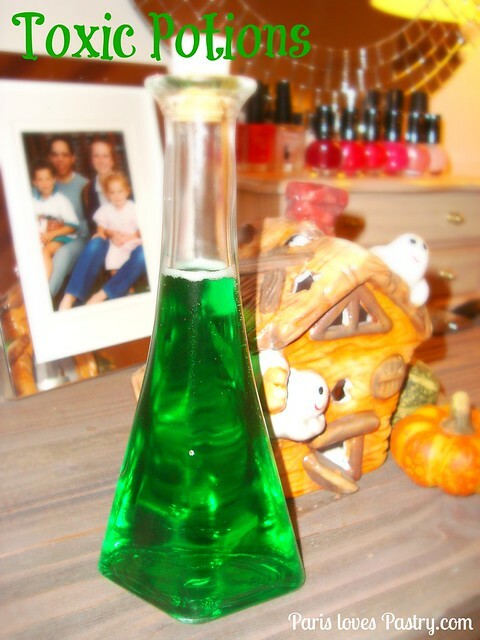 There will be a costume involved, Nightmare Before Christmas cupcakes and even toxic potions! 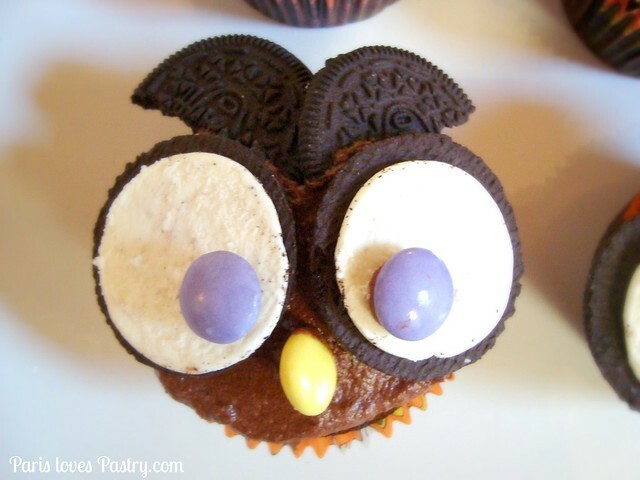 For the oreo owl cupcakes I made yesterday, I used regular, large oreo's instead of the mini oreo's I used last time I made them. It actually worked out better, because the oreo-top was easier to slide off without damaging the white filling. Colorful eyes & noses are made out of Smarties. Just a regular chocolate frosting, but the most delicious, moist chocolate cake recipe (my favorite go-to recipe)! Rating: 5 out of 5. 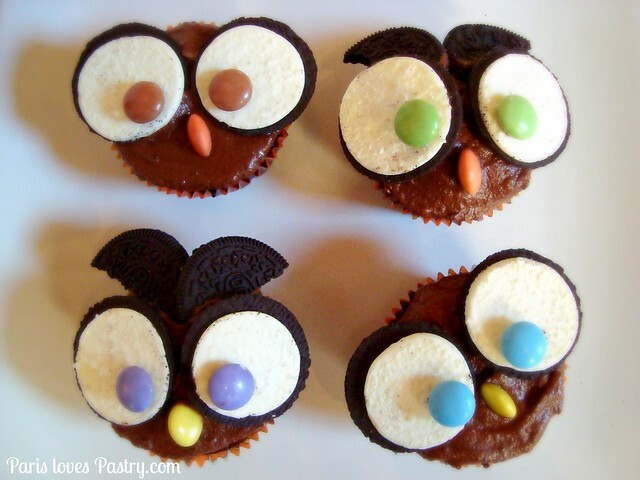 Oreo Owl Cupcakes: for a detailed how-to, click here. Chocolate cupcakes recipe from Trophy Cupcakes. - Preheat oven to 350°F/180°C. Line 2 standard muffin tins with cupcake liners; set aside. - Sift sugar, flour, cocoa powder, baking powder, baking soda, and salt together into the bowl of an electric mixer. Using the paddle attachment, mix ingredients together on low speed. - In a large bowl, mix together eggs, milk, oil, and vanilla. Add to flour mixture and beat on medium speed for 30 seconds. Scrape down sides of bowl and continue mixing on medium speed for 2 minutes. - Add boiling water and stir to combine (with a spoon, not a mixer! it will splash around your kitchen); set cake batter aside. - Fill each muffin cup three-quarters full with cake batter. - Return to oven and bake, rotating pans halfway through baking, until tops are firm and a cake tester inserted in the center comes out clean, 18 to 20 minutes. - Transfer muffin tins to a wire rack and let cupcakes cool in pan for 10 minutes. Remove cupcakes from pan and let cool completely. - Sift together the confectionars's sugar and cacoa powder. - Add the softened butter, milk and vanilla. - Mix until the frosting has a slight dropping consistency. 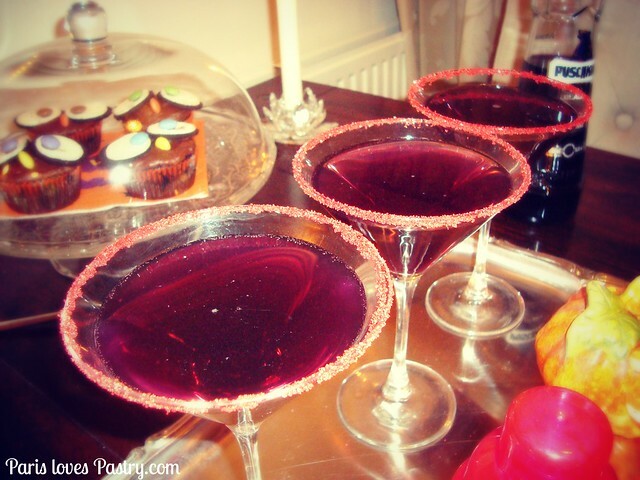 3 parts prosecco, 1 part black vodka, 1 part campari. served in a fun glass. What are your plans for Halloween? Ps. This is my 555th post! Loving the owls! They are so cute! These are such cute ideas!